A ramp can help those who use wheelchairs or walkers to ascend a short set of stairs leading into a home or between rooms. This enables disabled people to be more independent. Ramps also prevent a caregiver from straining his or her back maneuvering the wheelchair and its occupant to the next level. 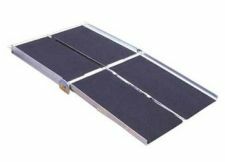 A portable ramp is useful when visiting or traveling. Although most public buildings and sidewalks are wheelchair accessible, private homes usually are not. A portable ramp can avoid the embarrassment of having to be carried into someone’s home or the risk of falling if the chair is leaned backward to mount a step. Portable ramps are usually made of aluminum. This material is lightweight enough that some disabled individuals can lift the ramp from a car. Permanent ramps are typically made of aluminum or wood. Semi-permanent aluminum ramps with handrails can also be used in the home temporarily while a broken hip or other injury heals. 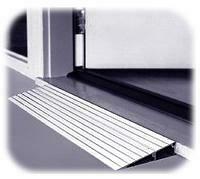 If someone merely needs help getting over the threshold of a door, threshold ramps can be used either temporarily or permanently. Threshold ramps are usually made of either aluminum or hard rubber. A threshold ramp is the least expensive to purchase, ranging from approximately $25 to $400. Next in price is the portable ramp, which runs from $65 to as much as $2,000. A permanent or semi-permanent aluminum ramp with rails ranges from approximately $450 to $1,100. To have a professional carpenter build a wooden ramp typically costs $100 to $250 per linear foot, including materials. Homeowners with basic carpentry skills can construct a wooden ramp themselves for the cost of materials, usually $500 to $1,000 for the entire ramp. Some charities have volunteers who will construct a ramp for the cost of materials. Read more on our recommended selections of handicap ramps for the home. Disability ramps last for many years with minimal maintenance. A ramp that is used outdoors will require shoveling or salting in snowy weather, and wooden ramps periodically need a new coat of paint or acrylic finish. Bolts and screws should be periodically checked to make sure they are tight.